It is pretty clear we live in a social media crazed world. But, that’s because it’s how people communicate. Here are all the reasons social media can help you increase your brand awareness. It’s easy to assume why building your brand awareness is critical. Social media can help this happen because it’s a platform with a ton of people in one place. Thus giving you the potential to be seen by more and more people. It just makes sense. According to a study by Hootsuite, the number of people on the internet in 2018 was 4.021 billion, that is up 7 percent from the previous year! Not all of those are using social media, but Statista predicts there to be a steady incline of social media users for future years. By 2021 that could mean 3.02 billion social media users. So how can social media increase the brand awareness for your brand through all that noise? Let’s recap… What is brand awareness? It’s simply the extent to which someone can recall or recognize a brand. Brands with good brand awareness are ones that frequently get brought up in conversation and are big players in the decision-making process. This alone screams the importance of brand awareness. How does this play into social media? We’re living in the world of social media marketing and every business knows the importance of social media. Whether you are using influencers, referrals, or simply putting out good content yourself, social media has proven to be a key factor in creating brand awareness. This is because social media is a great platform for brands to maintain customer relationships, while also having the opportunity to be found by new leads. In fact, a lot of people learn about new brands because it was mentioned by a friend on social media. Let’s cover a few ways social media is used to build brand awareness. The truth is there are multiple ways to use social media for building brand awareness (check out how these 30 influential companies use social media). And, the best part is, you can explore them all if you choose. Here are a few ways social media can supercharge your brand awareness. Social sites are a playground for engaging with one another. This lends it to be a great place for you to engage with customers at every stage of their journey with you. Whether they are potential leads, current customers, or people you are trying to get back. You have multiple ways to engage. Be it through conversation, a retargeting, ads, etc. You may have seen your favorite brands sharing their content on their social platforms. Many brands like to use this a space to push out their blogs, videos, and other content they have worked hard on. This is simply because their following is likely to be people who are interested in what they have to say, not to mention may find it useful. By sharing content, you are also making it easier for people to see it, find it, and share it. Meaning you have the potential to build brand awareness by sharing your owned content. This is an obvious one. But, social sharing happens on these platforms. And social sharing can be quite impactful for a brand. By creating something shareworthy, a brand can extend their reach. 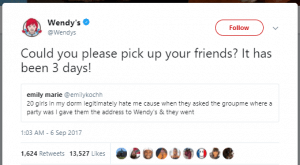 Think of Wendy’s comebacks on Twitter. That created a fan uproar, and thousands of retweets because people found it funny. If you create something that people find funny, believe in, or can have an emotional attachment towards, you’ll find it is an easy thing to share. You can also make this easy to do. Think about your blog or a blog you frequent. There are likely social sharing buttons. Convenient, right? Think about an eCommerce store you have bought from, they probably used social share buttons too. You may find that having a good balance between being conversational and providing insightful content gets social sharing to occur. Another tip is to mention people and strike up conversations as well, people will likely return the favor. The point is, get social sharing to occur because it can expand your reach. As your follower share with theirs, and so on. We all know how important it is to measure your efforts to see what’s working for you and what’s not. You probably use a good tool for this, and might even have daily or weekly reports sent to you. A few tools you’d probably consider are social analytic tools and social mention tools. You can even use your social profiles as they provide you with some valuable insight as well. A social analytic tool that many people talk about is Ahrefs. This particular tool allows you to see what your competitors are doing well, and how you can do it better. It’s a tool that is designed to help you grow your traffic. Brand 24 can be a great social mention tool to use too. This type of tool does a great job at letting you in on who is talking about you and your industry. You’ll be able to see where your brand is mentioned and on what networks. That way you can plan a course of action and use it to build your brand awareness. Honestly, there are a variety of ways you can increase brand awareness through social media. Some of which falls under topics that we have already covered in this article. Like using a tool to track social mentions and engagement analytics and creating shareable content. So, we’re going to discuss the top 5 steps we think matter most. They do say an image is worth a thousand words… and it’s true. Visuals are appealing. People will actually stop scrolling to stare at something if it’s interesting. You can find ways to incorporate your brand into images too, to help make your logo or name more well-known. After all, you first have to start with brand recognition before you can work towards achieving brand awareness. Think of the content you share, you likely add an image because it helps break up the text and allows you to help explain what you’re talking about. You might also use visuals like gifs or memes to reply to comments or to just add some fun to your feed. The point is, a good visual can make your shareable. Which can pave the way for you to achieve high brand awareness. 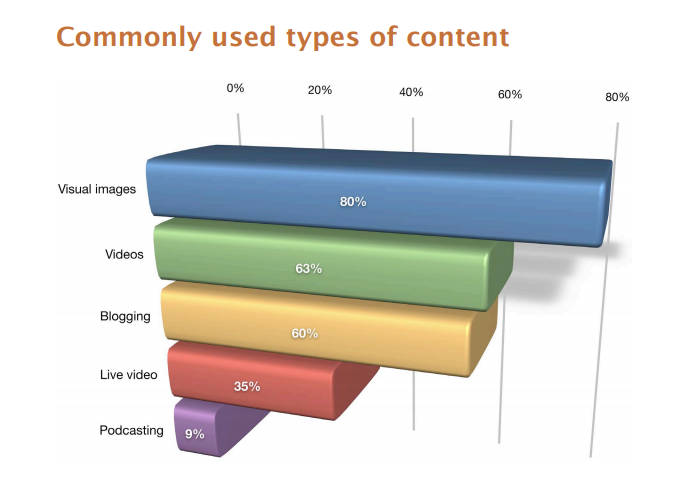 In fact, around 80% of marketers use visual assets in their social media marketing. According to Social Media Examiner. Automation is cool, in fact, it’s great. But, you have to do it wisely. Meaning what you might tweet isn’t really what you’d want to say on Facebook. There are limits with Twitter updates and the use of hashtags. The same cannot be said for Facebook. You have more room to talk and hashtags don’t work quite as well. So, if you’re automizing your social profiles, at least take the time to create a specific message for each. Even if it’s to talk about the same thing. You need to make the message native to the platform for the best chance of it catching someone’s eye. You’ll need to consider what else should be done for other platforms as well. Instagram can be great, but you need a killer image and a quick-wit caption to relay your message. You aren’t doing yourself any favors if you don’t actually communicate with others. Connecting with other brands, customers, influencers, and so on is how you can create a name for yourself. You’ll be able to increase your brand awareness and show that you know what you’re talking about. Plus, If you participate in engagement yourself, others will see that it’s not just a one-way street. By doing so, you’ll also likely see an increase in your social currency, and find that people are more likely to mention and recommend you. What do we mean by consistent? In this instance we’re not talking about posting regularly (though that is important too), we’re talking about your brand. Do your social media profiles reflect your brand? You need to make it clear who you are because this leads to strong brand recognition and thus creates awareness. You’ll want to make sure your logo is definitely on your profiles somewhere. The logo (aside from your name) is the easiest indicator it’s you. To make things even clearer, use the same language, colors, and images (or at least similar ones) so that it’s a clear cut sign who you are. It makes it much easier for tagging you too! A social media ad can be a great addition to your overall social media strategy. If you use paid ads and campaigns wisely, you have great potential for increasing brand awareness. 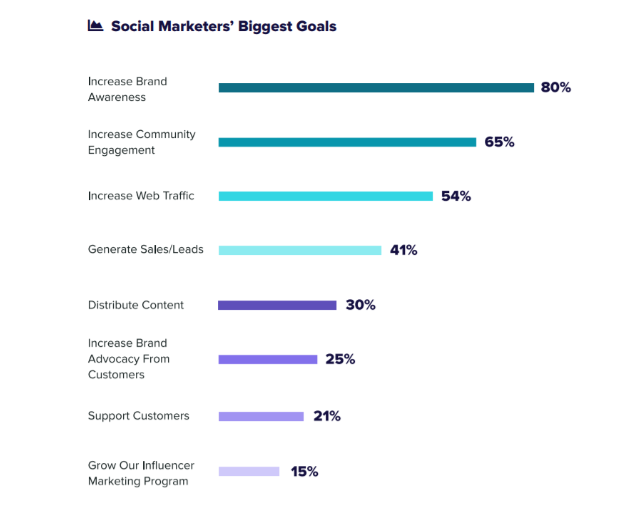 Whether you try your hand with influencers, referral marketing, or simply promote your content, you can reach a specific goal. These types of campaigns are easy to track and manage, which often helps smooth out bumps and that’s what makes them successful. Let’s take a look at a few social media campaigns people have run to increase their brand awareness. Standing out in a densely covered industry can be hard. Purple mattresses have been able to tap into this niche and be successful. Purple specializes in direct-to-consumer mattresses. They have been successful partly due to their social media strategies and ads. For example, they use comedy on social media to not only brag about their product but to grab attention. 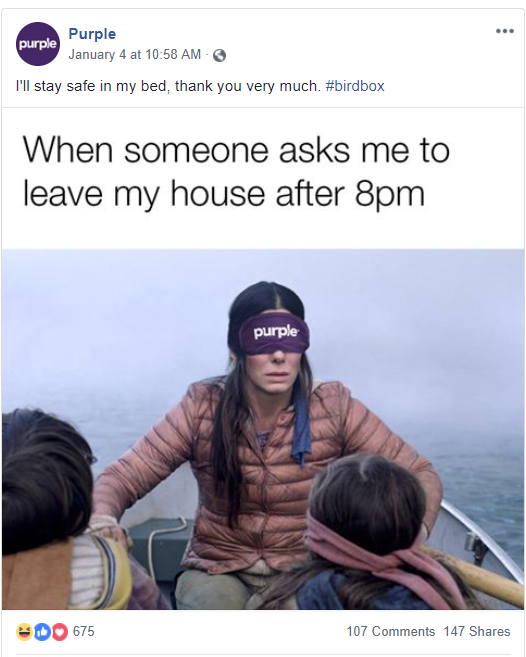 This Facebook post, for example, uses current trends (Bird Box, which is making rounds all over social platforms) to make itself funny, relevant, and interesting. The hard thing about mattresses is that not everyone needs one when they see your ad. So, trying to find ways to make yourself memorable or stand out, are key in this aspect. Purple has released a few videos that further help explain why they are different and worth the purchase. They play up their mattress to be one that you’ll never want to leave. Also, check out they engage with customer questions – which can lead to brand awareness! The “Will it blend campaign” shows off it’s blending power. And frankly, people like it. They show off their blender in a variety of videos, blending random things, and of course, asking the question “Will it blend?” These videos served the purpose of creating entertainment and showcasing the product, and it worked. Their video campaign had a ton of viewers and that led to more and more content ideas as they continued to blend random items. Gamers unite. Most people have heard of Nintendo, and have played a variation of it at some point in time. Whether that be an old school console or something new. Though they are a well-known name, they had a new concept and product they wanted to push. In this case, a console that would allow users to switch how they played, a back and forth device that can go from handheld to tv console. The Nintendo campaign used consistent branding and messaging to accomplish this. 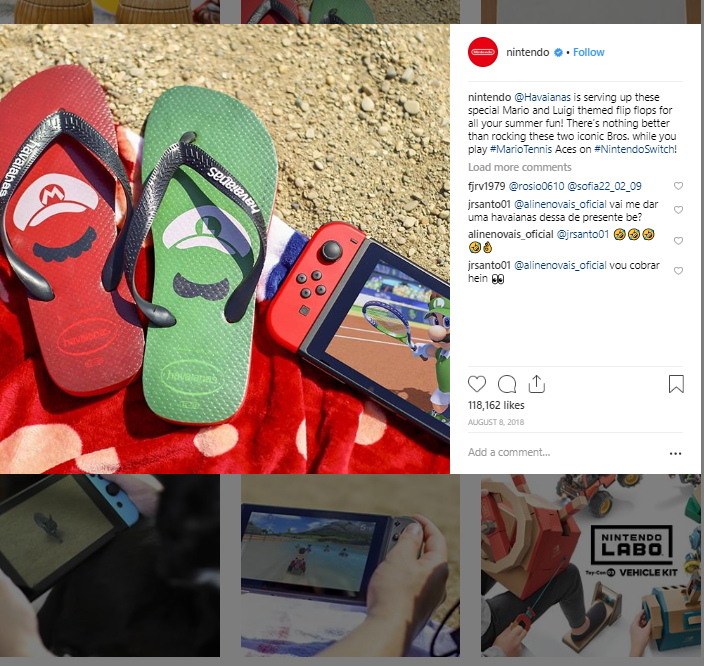 If you browse their Instagram, for instance, you’ll see the Switch blends in nicely with the rest of their content, while also showcasing the flexibility it has to be an on the go device. As you can see, there are plenty of ways to increase your brand awareness, and social media is by far one of the best channels to do this. You can communicate with your customers and just as easily be introduced to new people. Plus, you have a great channel to share your content. Just make sure you’re using each platform wisely, and of course, communicating and engaging when necessary. What Can an Incentive Program Do for Your Business?